It's no secret here on JD that I adore using sun-dried tomatoes in my cooking whenever I can. So, I was thrilled when Mooney Farms offered to send me a shipment of several of their fabulous Bella Sun Luci sun-dried tomato products a couple of weeks ago. I've been experimenting with their different varieties in my cooking recently and hope to have more recipes to post in the near future, but I wanted to share this simple take on a previously posted JD recipe (my Fresh Veggie Pizza Wonton Cups). For this version, I utilized a similar cream cheese base recipe, but made these into mini wonton cups. I crowned the tops with chopped sun-dried tomatoes and scallions. These mini appetizers are quite simple and uncomplicated, yet pack a major flavor punch. These are great for parties since almost all of the prep work can be done in advance (prep ahead instructions can be found at bottom of post). 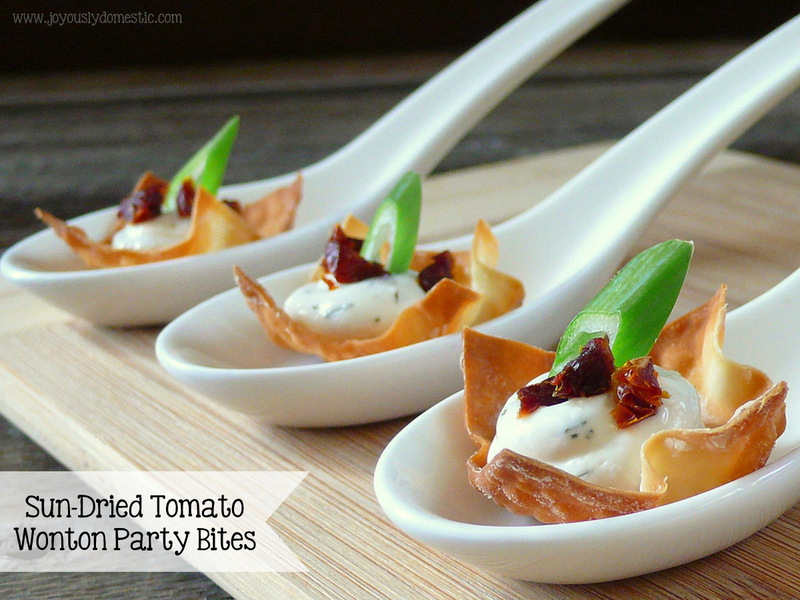 Guests seem to love wonton cup appetizers, so these just may be the perfect flavorful bites to serve at your next gathering. Combine together the cream cheese mixture ingredients in a medium bowl until smooth. Set aside. Preheat oven to 350 degrees. Lightly mist the wells of a 24-count mini muffin tin with non-stick spray. Using a sharp knife or pizza cutter, cut the wonton wrappers into four equal squares. Carefully press each small square down into the well of the mini muffin tin until you've used all 24 wonton squares. Lightly mist the tops of the wonton cups with non-stick spray. Bake for around 5 minutes or until the wontons are lightly browned. Remove from oven and transfer cups to a cooling rack to cool. Once fully cooled, spoon or pipe the cream cheese mixture equally into the cups (piping looks more neat). Top with a scallion sliver and 3 - 5 pieces of sun-dried tomato. Serve within two hours. *For this recipe, I topped some of the cups with the unseasoned, plain variety of sun-dried tomatoes and some with the "zesty peppers" variety. Both worked great, so the kind you use will depend on your preference. NOTE: Wonton cups can be baked and allowed to sit out several hours in advance (or even overnight if stored in an airtight container) prior to filling. The cream cheese mixture can be made the evening before (or morning of) service and stored in the refrigerator. The sun-dried tomatoes and scallions can be chopped/sliced in advance. Shortly before party time, fill wonton cups and top with toppings. Disclosure: Mooney Farms provided me with the products shown in the above photo. However, no monetary compensation was provided. All opinions and views expressed on Joyously Domestic, the blog, or social media are solely my own.